Let’s say you have a loved one who doesn’t cook (ahem) and Valentine’s Day is just around the corner (ahem) and you’re sick and tired of slaving over a hot stove, day in and day out, and wish that just once (ahem) they’d make you dessert. Ok, my “ahems” are a bit unfair: that made it sound like I’m complaining about my own domestic situation. I’m not. I don’t want Craig to make me dessert–I like making my own dessert, thank you very much–but you, yes YOU, may wish your loved one to make you dessert this Valentine’s Day. It’s very understandable. Well here’s the solution: open up this post on their computer, leave it open, and maybe they’ll get the hint. This is a pretty foolproof beginner cook dessert option and it’s out-of-this-world good. 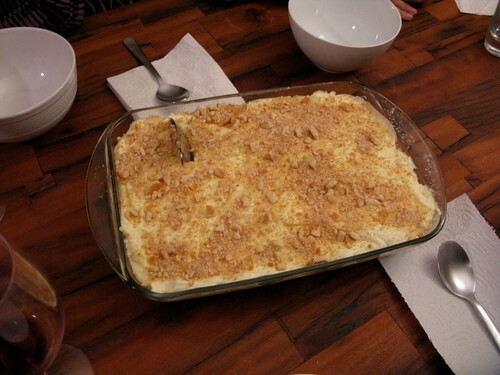 My first taste of the Magnolia Bakery banana pudding was at my neighbor Ameer’s apartment. He had a work event with a surplus of Magnolia cupcakes and other treats including a carton of their famous banana pudding. 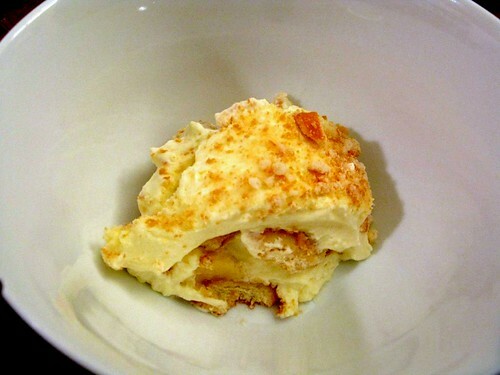 One bite was enough to convince me that this was a serious banana pudding; yes, it made my teeth hurt (it’s very sweet) but the way the creaminess contrasted with the cookies and the bananas was addictive. I could’ve eaten the whole carton. Hmmm. I think it’s debatable. If I were a journalist, I’d pick up my phone right now, call and find out. But I’m not a journalist. I’m a food blogger. 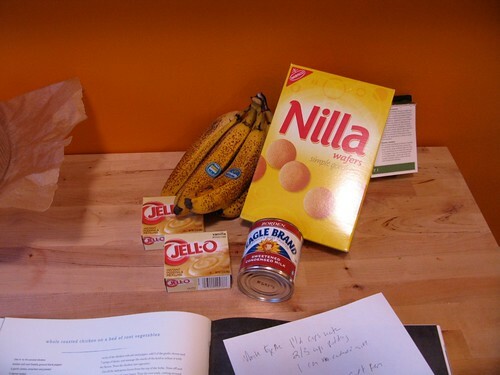 That’s instant vanilla pudding mix (you’ll need 2/3 a cup of it, about 1 and 1/2 packages), sweetened condensed milk, heavy cream, 1 box of Nilla wafers and 4 ripe bananas. 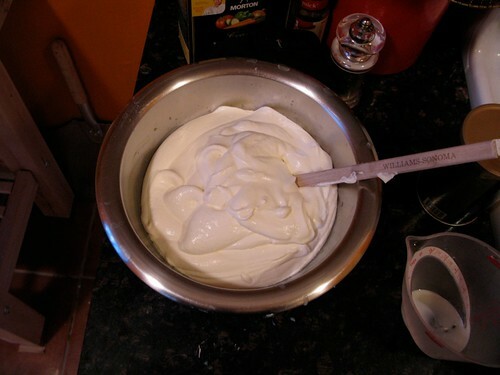 Whisk in 1 1/2 cups water and 1 14-oz can sweetened condensed milk. Once it’s whisked together, let it sit for 15 minutes: it’ll thicken up. 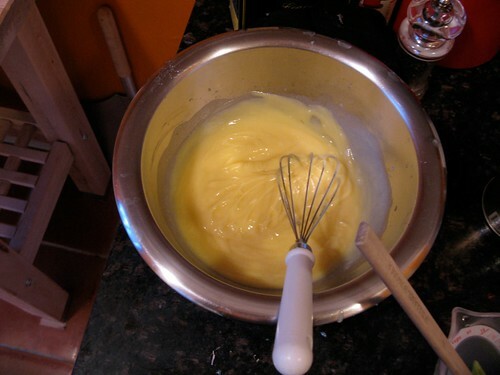 Whisk casually every few minutes until it’s nice and thick. 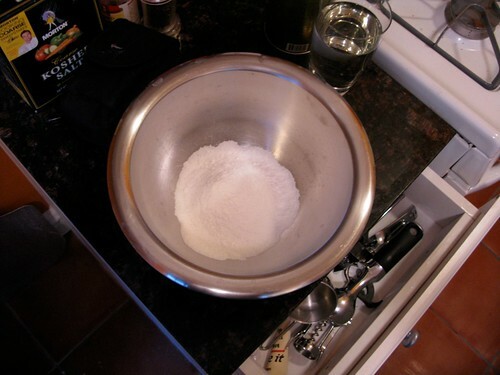 Then you take 3 cups of cold heavy cream and put it into a mixer bowl with a whisk attachment (for extra whipping mojo, put the bowl and whisk attachment in the freezer first; a cold bowl and whisk makes it whip better). Whip that cream until you get soft peaks. That means it’s thickish and when you turn the mixer off and lift up the whisk attachment, you’ll see a crooked bird beak of cream hanging off. 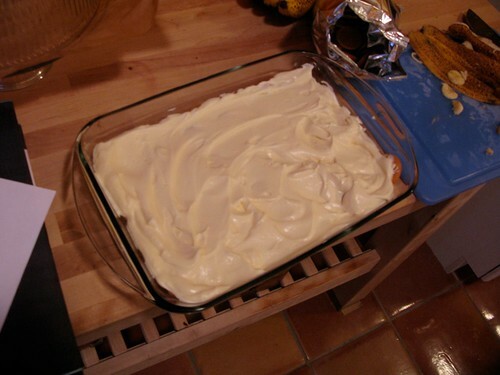 Fold the cream into the pudding base. If you’re a culinary Cassanova and cooking for your first time, folding means to incorporate without deflating the air; you do that by dragging your rubber spatula across the center of the bowl, lifting up the mix and folding it over. You don’t stir. It should all stay light and fluffy and be throughly combined when you’re done. 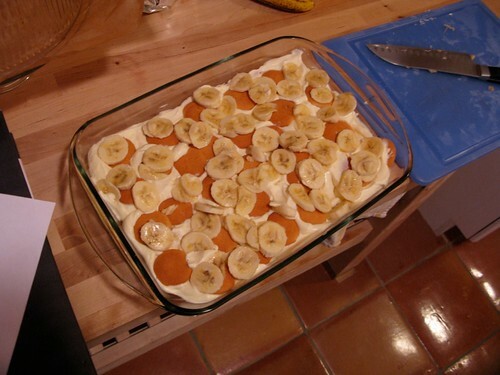 And that’s all the cooking you need to do to make this pudding. Everything else is self-explanatory. Slice up your bananas. Get out your Nilla wafers. 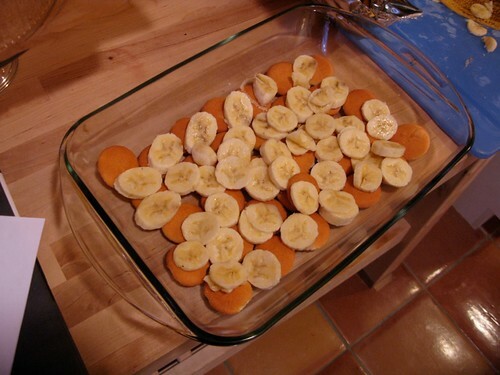 Arrange 1/3 of Nilla wafers along the bottom of a 9 X 13 baking pan; top with half of the bananas. How’s that for a love letter this Valentine’s Day? Cover with plastic wrap, keep in the fridge (it should be in there for a few hours to meld; it gets better the next day), and when your loved one comes home tell them to get into bed. Then walk in wearing only an apron carrying this and two spoons. And a toothbrush: again, it’s really sweet. Whichever path you choose, I wish you and yours and your cat have a very happy Valentine’s Day.